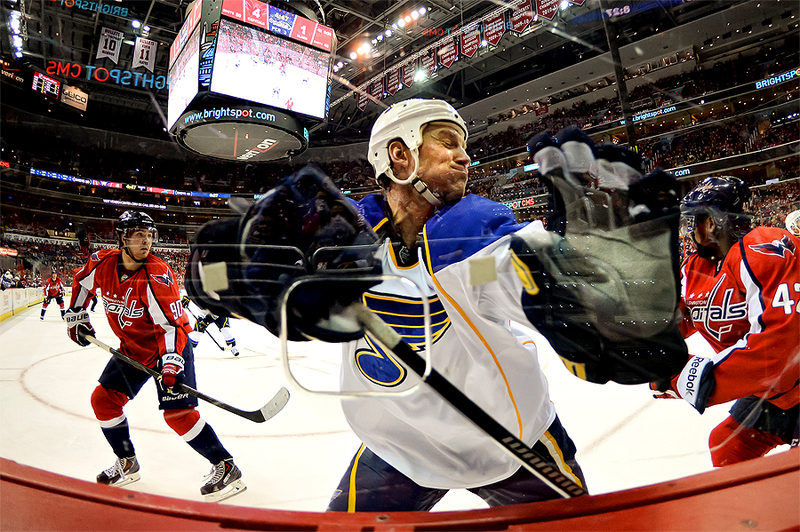 "Jay Bouwmeester #19 of the St. Louis Blues crashes into the boards against the Washington Capitals in the third period during an NHL game at the Verizon Center on November 17, 2013 in Washington, DC." Like anything new, it takes time to get into a good rhythm. After my first couple games, I am really getting into the groove of shooting ice hockey. With limited places on ice level to shoot from, it makes it a challenging sport to photograph - and I always enjoy a challenge. One of the best parts of the sport is knowing these big, fast and strong athletes cannot take me out if they lose control or are hit right in front of me. Unlike field sports, the boards and glass create a thin barrier between the action and myself. And while it's difficult not to flinch when a puck or player comes at you full speed, it usually makes interesting images. I'm just hoping the glass never breaks when they crash in front of my lens. "A fan walks into the stadium before the Hawaii Warriors play the Navy Midshipmen at Navy-Marine Corps Memorial Stadium on November 9, 2013 in Annapolis, Maryland." I am regularly asked by friends and family what type of camera to purchase. My answer is always the iPhone. I do a fair share of shooting with my iPhone because it's convenient, small and fits in my pocket. 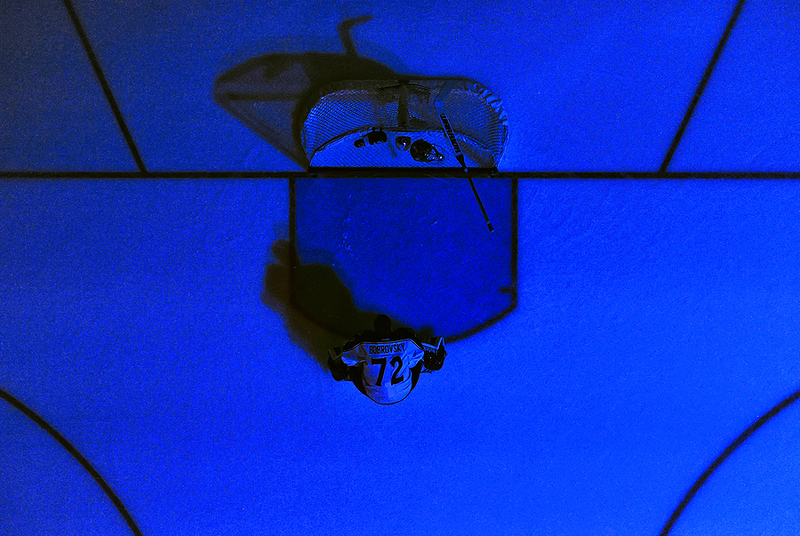 This is an example of a photograph I shot with it before the Hawaii against Navy football game. 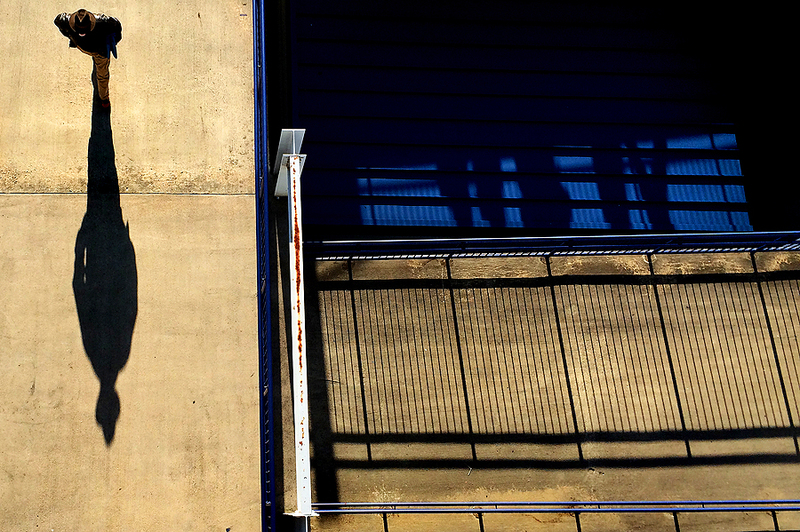 Walking across the stands to check the feel of the weather, I saw this nice light and shot a couple of images. Since I didn't have my big cameras on my shoulder yet, my first instinct was to grab my iPhone and it did the job flawlessly. 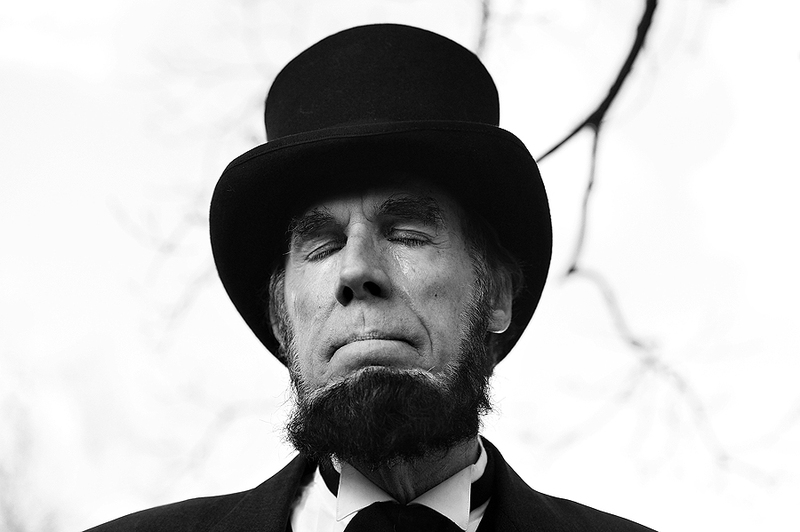 "Portraying U.S. President Abraham Lincoln, Tom Scott, talks to visitors during a commemoration of the 150th Anniversary of the Gettysburg Address at the Soldiers’ National Cemetery Gettysburg National Military Park on November 19, 2013 in Gettysburg, Pennsylvania." In fifth-grade I had to memorize the Gettysburg Address. At just more than 250 words, I don't remember being able to recite the entire thing in one take. Last week, I got to document the 150th anniversary, celebration of the iconic Gettysburg Address for Getty Images. To hear it from Abraham Lincoln himself - or a man portraying him impeccably - was compelling. Listening to speech from a spitting image of Lincoln, with most likely the same inflection, meant so much more now than it did when I was young. It was an interesting assignment where lots of folks came together to celebrate history. With lots of reenactors looking exactly like Lincoln once did, and others braving the cold wind, it wasn't hard to find features. 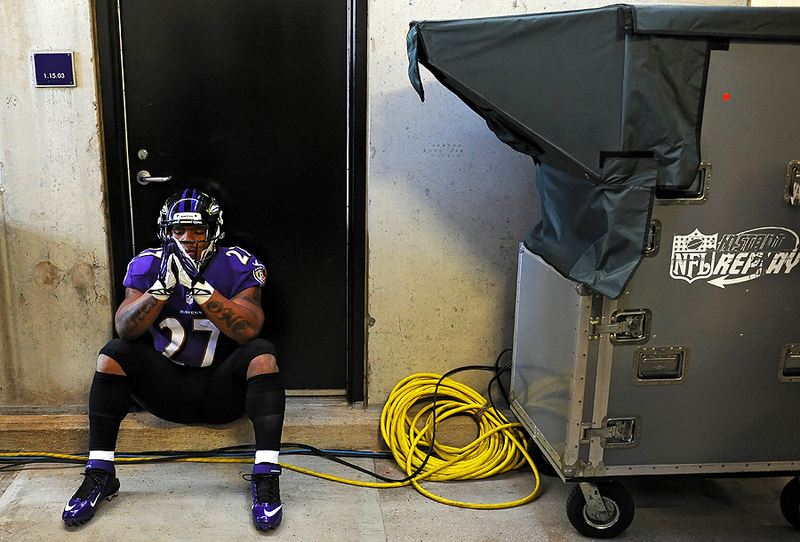 "Running back Ray Rice #27 of the Baltimore Ravens has a moment to himself before playing the Cincinnati Bengals at M&T Bank Stadium on November 10, 2013 in Baltimore, Maryland." There is nothing more fun than to document a fierce competition - no matter what the sport. Whether it's regular season or the championship - the best games to cover are the ones that come down to the wire. For the Cincinnati Bengals game against the Baltimore Ravens it wasn't looking like much of seesaw type of battle on the field at first. The Ravens took an early lead, but their comfortable lead would soon vanish. With time ticking off the clock in the fourth quarter, the Bengals launched a hail mary into the endzone where the ball was tipped into the air and into their hands again - forcing the game into overtime. In overtime, the Ravens took command, again, and chipped a field goal to seal the victory. An exciting second half, these types of games are the kind that excite everyone from: fans, players and photographers. 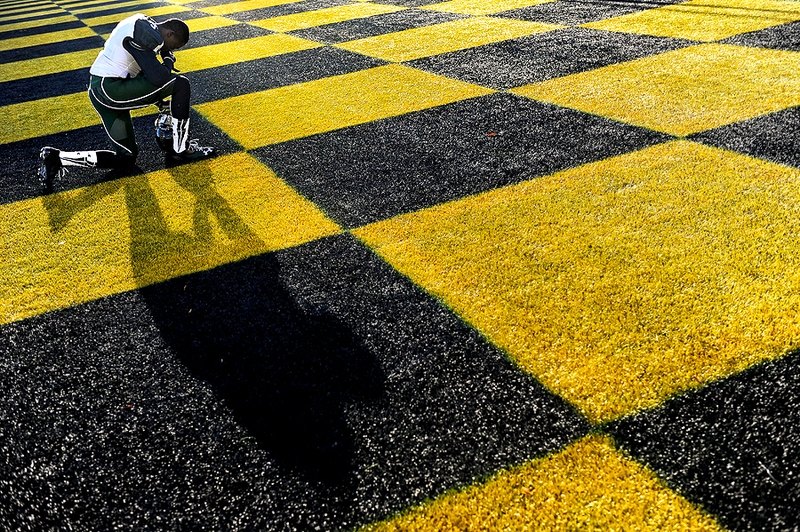 "Wide receiver Chris Gant #9 of the Hawaii Warriors has a moment to himself before playing the Navy Midshipmen at Navy-Marine Corps Memorial Stadium on November 9, 2013 in Annapolis, Maryland." Last weekend, my two days of football coverage started with the win-less Hawaii Warriors taking on the Navy Midshipmen in Annapolis, Md. I decided to work features before, during and after the game and wasn't let down by the amount of moments that unfolded in front of my camera. My job was to document the Warriors mostly because of their story. If they won, it would be an upset and their first victory of the season. And if they lost, it would mean another dent in their season. Things started off quick with Navy scoring, but by halftime the two teams were all square. What looked like a blowout as the second half begun, a late rally had the Warriors seeking a victory, but by the end of the game, the Warriors took yet another loss. "UFC light heavyweight fighter Phil Davis works out with Penn State wrestling coaches during the '20 days to UFC 167' media tour at the Lorenzo Wrestling Complex on the campus of Penn State University on November 7, 2013 in State College, Pennsylvania." 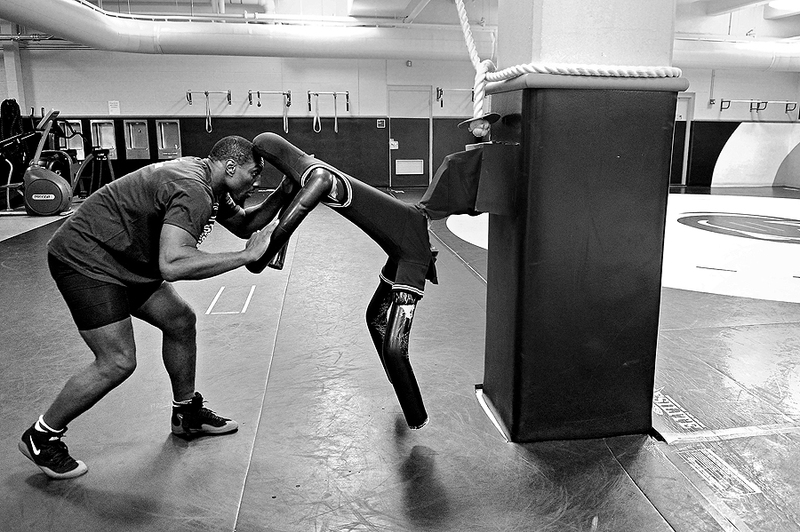 I recently had the opportunity to document UFC fighter Phil Davis for Getty Images. Davis, a Penn State alumnus, returned to the university to do a media tour before the UFC 167 event. From training with wrestling staff, to visiting old friends and places on campus, it was a interesting glimpse of an athlete who excelled in (and still after) college and returned to give back. These are the type of assignments I love to shoot. I really enjoy showing the behind the scenes of athletes and their training - it's an raw look at how hard these guys and girls train to become the best at their respective sport. Not to mention, my job was easy, as Davis is a class act athlete who made the day enjoyable for all around him. He understood my role as a photographer and was happy to give me full access for the day. For that, I am grateful and wish him the best in the UFC. 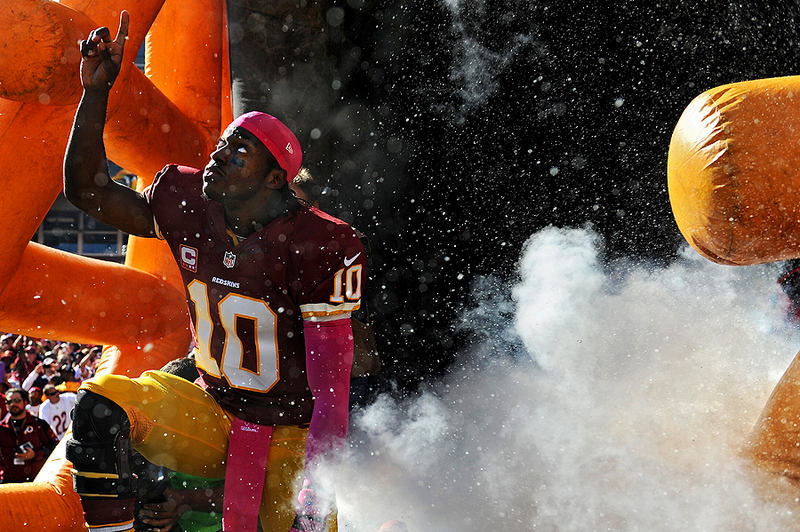 "Quarterback Robert Griffin III #10 of the Washington Redskins is introduced before playing the Chicago Bears at FedExField on October 20, 2013 in Landover, Maryland." I always shoot pre-game ceremonies as a way to get my own jitters out before a game. From being in the tunnel during warmups to photographing players running from the smoke seconds before kick-off - it's a good way to prepare for the game itself. But I often think how nervous are these superstar athletes? Like photographers, I'm confident they have their own rituals, superstitions they go through, too. But on the outside they're often cool under pressure. It would be interesting for sure to hear how they feel on the inside before game time. Much like the aforementioned, this was a favorite frame of Robert Griffin III before his Washington Redskins played the Chicago Bears. 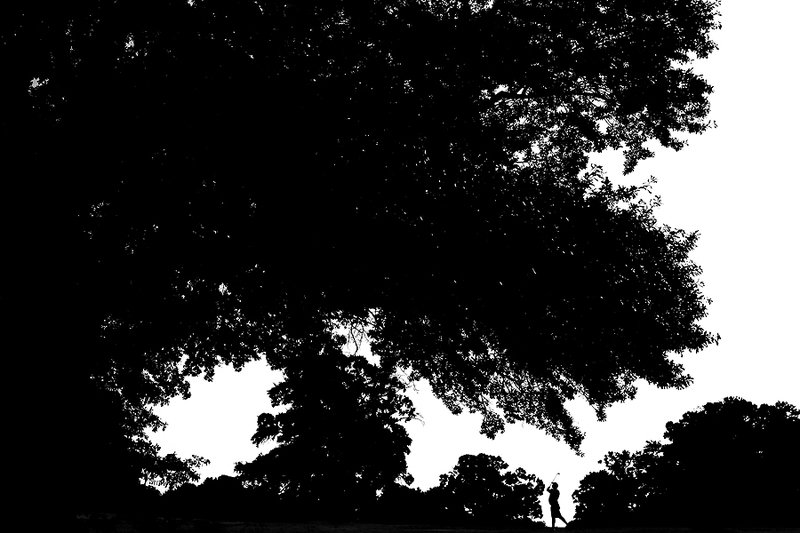 "A golfer hits during play at Alfred Tup Holmes Golf Course on August 29, 2013 in Atlanta, Georgia." Sometimes a photographer needs one thing - and it's not putting the camera down - it's to go out and shoot for themselves. Documenting sporting events usually means shooting from predetermined spots, capturing every single decisive moment and sending those images on tight deadlines. In short, you need to be alert, ready for anything and have game plan. Conversely, shooting sports for yourself is a different game. You're not entirely moment driven, can typically shoot from anywhere and can try some things you may not be inclined on doing during an important game. So as you can imagine, shooting a group of friends playing golf is just as therapeutic as playing the game yourself. If you want to hammer on the motor-drive during a back-swing - you can. If you want get two feet from your buddy as he chips of out the bunker - no issue. Likewise, if you want to stand in the middle of the fairway to shoot a wide frame - no problem there. The latter is exactly what was going on in the above frame. I can't lie, it's a candid beautiful moment of a friend as he tries to hit back onto the fairway. I had a lot of fun documenting my buddies play golf and shooting images of them that they'd never be able to have otherwise. Now only if I can talk them into shooting graphic moments of me playing sports.